The group of companies “UkrAgroCom” and “Hermes-Trading” does not stop at the achieved, constantly developing its activities and increasing production volumes. We firmly believe that a prosperous village, high yields and the wealth of peasant families are the guarantee to a stable future of Ukraine. The basic principle of the group of companies “UkrAgroCom” and “Hermes-Trading” as a socially responsible business is to promote the welfare of society. Perfection lies in the progress: he, who is constantly moving forward is perfect. Self-improvement in all areas highlights a group of companies “ UkrAgroCom” and “Hermes-Trading” among others, allowing them to hold leading positions among farmers and grain traders in Ukraine. By learning and consistently implementing the best world practice and the most advanced production technologies, our group of companies constantly follows the chosen motto: “Do not stop on the achievements!” This slogan demonstrates our experience of previous years and no less ambitious plans for the future. To let all rural workers to feel themselves and their work to be very important to the society and country, the group of companies “UkrAgroCom” and “Hermes Trading” is actively engaged in the social development of human settlements. It works especially successful if the efforts and desires of business, local government and the rural community are combined together. “UkrAgroCom” was one of the major investors in the project of the high pressure gas pipeline Moshoryne – Nova Praha. With significant support of the group of companies “UkrAgroCom” and “Hermes-Trading”, such projects as repairing of roads in many villages and a district center, the renewal of work of preschools and opening of the additional groups of kindergartens are being realized. The company constantly concerns about education. In secondary schools and kindergartens renovation is all over the place: heating systems, roofs, canteens and sports halls; improvement of the material base: new furniture, specialized study rooms in physics and chemistry, new equipment for canteens, computer equipment and sports equipment. In addition to the already traditional help the schoolchildren from Nova Praha and Izmailivka and from surrounding villages, have received new buses as a gift from “UkrAgroCom”. Now with the participation of the group of companies a regional program “School desk” is being implemented. These are just a few strokes from the large amount of work done for the people of Kirovograd region with the patronage of our group of companies. By joining the desires and efforts of local authorities and local businesses the construction of the gas pipeline “Moshoryne – Nova Praha – Holovkivka” (29.4 km), started in 2005, was realized in a short time. Construction of the first stage of the gas pipeline “Moshoryne – Nova Praha” with a length of 13.8 km, was completed in 2010. This made it possible to gasify the houses of over 7 000 residents, schools, preschools, cultural centers, hospitals and other infrastructure objects of the village. Total investment is nearly UAH 7 million, UAH 2.1 million of which are subsidies from the state budget, UAH 1.8 million – from the district budget, 298 thousand UAH – from budgets of village councils, town councils and a lot of sponsors’ contributions, over UAH 2 million of which were invested by “UkrAgroCom”. A big work of the next stage was done in 2011 in a brief period of time, when 15.6 km of high pressure pipelines were laid from Nova Praha to Holovkivka and. At the beginning of October 2011 a symbolic torch was burned in a solemn atmosphere. The work on streets gasification continues. First dozens of houses of Holovkivka inhabitants felt the benefits of gasification before New Year. Last year the group of companies “UkrAgroCom“ and “Hermes-Trading” invested nearly UAH 10 million and not only provided a high rate of gasification of the village but also significantly reduced the cost of connection houses of Holovkivka people to the gas network. Today, with arrival of warmth, due to the high organizational participation and financial support of the company ” UkrAgroCom” the gasification of the Holovkivka streets actively goes on. Total amount of investment is UAH 17 million. 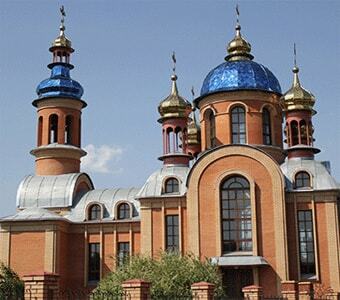 After two years of the “UkrAgroCom LLC” creation, in 2002 the foundation stone of the future church was laid, and in 2005 the center of the village got decorated with magnificent church of St. Elias (architect V. Rak), built by the patronage of the company UkrAgroCom. According to the legend, at the beginning of the XVII century a wooden church was built at this place and in 1870 a stone church was built right next to it dedicated to Life-Giving Trinity. This church was fully destroyed in 1936. Thus the constructed church of the Holy Prophet Elias became not only a real decoration of Holovkivka , but also a landmark of spiritual and moral life of its residents. It became the center of spirituality not only of the inhabitants of Holovkivka , but also of the surrounding villages and Oleksandria. Today many people attend it even from other districts at big holidays. 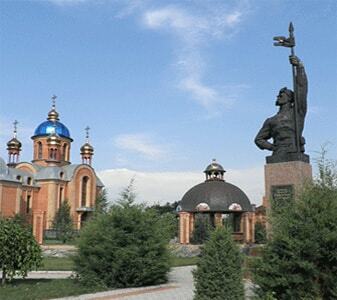 A pastor of St.Elias Church Archimandrite Christopher, always blesses the people of “UkrAgroCom” for good deeds, and thus the company takes care of the church and her parish, assisting in arranging it and having created a real exotic oasis in the surrounding territory. A great was also the desire of the villageres of Checheliivka, Petrivskyi district, Kirovohrad region to rebuild the ancient Holy Intercession Church, which had long time been half ruined. Although the initiative group to revive the church has been collecting charitable donations for years, but it is hard to believe that the church would be rebuilt without a significant financial contribution of the company “ UkrAgroCom” that only in 2011 exceeded UAH 26 thousand. Representatives of the group of companies “UkrAgroCom” and “Hermes-Trading” caring about spiritual centers of settlements, where they work are always desirable guests. Sport occupies a special place: it is loved and it is invested in. A great sports and health complex, built according to the latest European standards, was solemnly opened in 2008 with the funds of the “UkrAgroCom”. It includes a stadium of 90x 60 meters in size with comfortable spectator grandstands and VIP-tribune, tennis court, gym, locker rooms and recreation rooms for athletes and referees, sauna. A hotel was constructed as well. The stadium has become a favorite venue for cultural and sporting events not only at the village level, but also at the district and regional levels. With strong support of the company, the sport honor of Holovkivka is defended by 4 football teams: “UkrAgroCom-1” and “UkrAgroCom-2”, which are the participants and multiple champions of the region among the amateur teams of the I and II groups accordingly, and a team of veterans of the enterprise and Children’s team (department of Children and Youth Sport School “Kolos”). Once again a main team of “UkrAgroCom” has pleased us all having reached the opportunity to get into the II league in the nearest future. This year football players ahead of time became the absolute winners of the championship of Kirovohrad region among amateur teams in the first group. Volleyball is represented by the women’s school team and the men’s team “UkrAgroCom”, which repeatedly won prizes in district and regional competitions too. You can find more about sports life you can on the official site of PFC “UkrAgroCom”.